Danish pastries come in different varieties. This one is made with rhubarb and is quite popular across the globe. 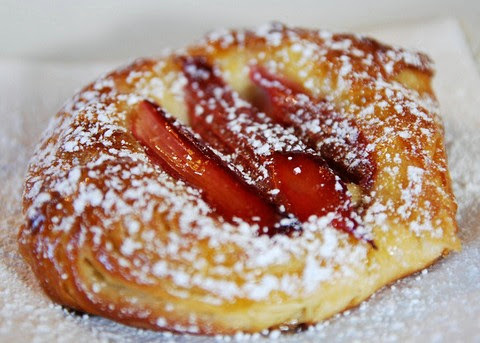 Apart from using rhubarb, people love to make regular fruit Danish pastry recipe which includes peaches or raspberries. Another popular variant in this category is delicious German rhubarb cake which is more or less similar when it comes to using some of the primary ingredients used in this preparation. Preparation time for this pastry is slightly more but the results justifies the hard work done. You can moderate the amount of sweetness, if required. For best results, work on the pastry dough. Let's make this sweet and irresistible delight for our loved ones and friends. Bake this puffy and sweet Danish pastry that includes flavored rhubarb stalks and a nice base of pastry cream to liven up your sweet taste buds in no time. Take a baking dish and add rhubarb stalks, orange juice, 1 vanilla pod seeds and 1 cup castor sugar in it. Gently mix with a spatula or a regular spoon until everything is mixed well. Seal the tray with aluminum foil and make one or two cuts to let the steam escape. Bake in a preheated oven at 200 degrees for about 10 minutes. Keep it aside to bring down to the room temperature. Whip one egg and add in 1 cup lukewarm milk. Pulse it for a minute. Add yeast in wheat flour with salt, butter and 1 cup castor sugar. Blend it in a food processor till it forms a smooth texture. Add egg and milk mixture prepared earlier in the flour base and blend all the ingredients till it forms a smooth and elastic pastry dough base. Cover with a plastic sheet and keep aside for 20 minutes. Cut the dough base into 10 to 15 rolls and make round pastry structure of about 1/2" inch thickness. Cover with a plastic sheet and again refrigerate for 15 to 20 minutes. Add 1 vanilla pod seeds in 1 cup milk and simmer on a low flame. Stir gently as the milk simmers for about 10 minutes. Meanwhile, add egg yolks, 1/5 cup sugar, corn flour and sweet hung curd in a bowl and whip briskly for 3 to 4 minutes. Slowly add vanilla flavored lukewarm milk in it and mix well. Transfer the entire flavored pastry cream base into a nonstick pan and simmer on a medium flame. Stir it until it thickens into a smooth paste. Bring down to the room temperature and refrigerate for at least an hour in the freezer compartment. Grease the baking tray and arrange round pastry dough rolls in it. Brush with egg wash and bake in a preheated oven at 180 degrees for about 5 minutes. Take out the pastry and carefully add pastry cream base in between with the help of a cone. Top it with sweet and flavored rhubarb stalks. Again transfer back to the oven and bake for about 15 minutes. Sprinkle icing sugar on top of the pastries and serve immediately.